The idea was suggested by the late Professor Jeffrey B. Harborne (University of Reading, UK) in 1985, as there were (at that time) many potential and eminent phytochemists in Asia based on the publication in referreed journals. Thus, PSA would be a good organization for the recognition of Asian phytochemists. Currently, some countries in Asia have their own Phytochemical Societies in which organized workshop and seminar activities are carried out with funding from UNESCO and other funding agencies. The idea of PSA was revisited in 1987 at Tokushima and in 1988 at the IUPAC meeting in Kyoto, Japan, but with no further action taken. An unofficial discussion followed in 2004 during the 20th Annual Seminar of the Malaysian natural Product Society in Kuching, Sarawak, Malaysia with participation of Malaysia, Indonesian and Japanese Scientists. Subsequently, during the International symposium on Natural Products and Medicinal Chemistry in Kuala Lumpur (August 2005) a special meeting on the formation of PSA was convened which was attended more than 30 scientists from Australia, Bangladesh, Germany, Indonesia, Japan, Malaysia, Pakistan, Philippines, UK and USA. A workshop group was formed which led to further discussions in November 2005 (Putrajaya, Malaysia, 21st Annual Seminar of Malaysian Natural Product Society) and in July 2006 (Tokushima, Japan, Mini-symposium on Phytochemistry) on issues such as name, official address, membership, committee, financial, rules and registration etc. The announcement of the foundation of PSA was made at the 12th Asian Symposium of Medicinal Plants, Spices and other natural products (ASOMPS XII, Nov. 2006, Padang, Indonesia) in which the planned lunching of PSA will be held in the August 2007 in Kuala Lumpur, Malaysia. 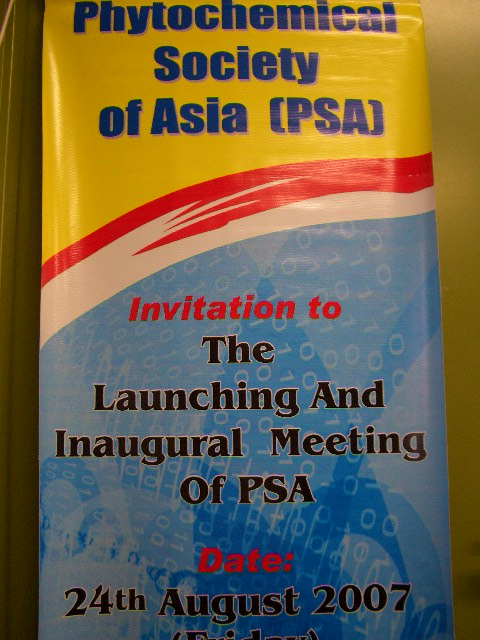 During the 12th Asian Chemical Congress (12ACC) held in Kuala Lumpur, August 23-25, 2007, the launching and inaugural meeting of PSA was held in 24th (Friday) August 2007 at Dewan Tum Hussein Onn PWTC at 18:00. President: Prof. Yoshinori Asakawa (Japan) was elected as the founding President of PSA. Vice President: Prof. M. Iqbal Choudhary (Pakistan) is vice president of PSA. Secretary General: Prof. Ikram Said (Malaysia) is the Secretary General of PSA. Hon. Treasurer: Prof. Hiroshi Morita (Japan) is the Hon. Treasurer of PSA. Regional representatives: Prof. Sjamsul A. Achmad (ASEAN), Prof. David Winkler (Pacific) and Prof. Mohammad Mosihuzzaman (South Asia) were elected as the regional representatives.